​See our latest and greatest each month under Specials. Following a thorough analysis of your skin, a treatment plan is discussed. Treatment includes a double cleansing to ensure all impurities are removed, a gentle exfoliation removes dead skin, steam to soften and extractions of blackheads. A relaxing aromatic massage, appropriate mask, and completed with the best moisturizers for your skin. Pure Relaxation is the goal. Our signature Inhalation therapy is used during the entire facial to calm, balance and rejuvenate the spirit. Gentle cleansing, steam, and calming mask. No extractions. Looking for some vitality? Glo Therapeutics Vitamin C products are power packed with firming and brightening agents. Great before a special occasion ! A deep cleansing treatment ensures proper removal of collected sebum and blackheads. Light polish removes dead skin followed by a papaya enzyme which softens pore follicles for easy extraction. This facial is extremely satisfying. An aromatic neck & shoulder massage will ease muscle tension. A powerful treatment for clients concerned with wrinkles and sun damage. A dose of antioxidants in every product help illuminate dull skin and smooth the texture. A mild peel is included to ensure maximum results. Layered with Vitamin C (Brightening),Seaweed (detoxifying) and Hyaluronic acid (re-hydrating) topped with a heated layer. This facial is the most power result driven Facial. 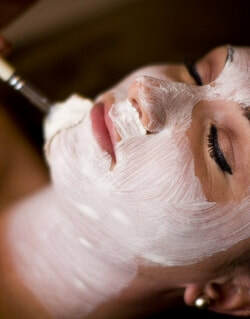 Facial massage or extractions, appropriate mask, condensed into a powerful mini treatment. A gentle facial to focus on areas in need. We will educate your teen on the importance of home care. Our signature facial on your back. A deep cleaning yet a nurturing experience. For a rule of thumb however many years of sun damage you have that's how many months it takes to correct it, so please be patient. Eye & Lip Treatment ~ 25 Smooths the delicate skin around the eye and mouth. Firm and tone the lax belly skin while your laying down. Ear Coning is a soothing procedure that removes ear wax with a comfortable feeling of warmth. Great for sinus and allergy sufferers.